In Indonesia I once visited a small island called Sumba. It is famous for its wonderful, powerful, small horses and famous for its tradition of burried people in the middle of the village. A very old couple decided …………for a Christian wedding. They invited all friends and neighbors and of course the Christian priest of the village. They also invited the Marapu priest who was asked for orientation concerning this decision. You must know, before that day, nobody in the village knew about the wish of this couple to become Christian. 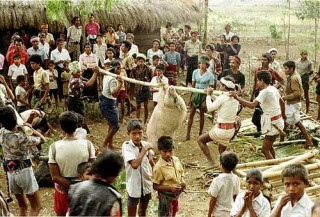 According to the tradition a very big pig was sacrificed. The Marapu priest then looked at the liver and the guts in order to find the answer to the question whether this couple should follow a Christian marriage or not. Of course the Marapu priest approved the decision of the couple and some days later they got married by a Christian priest. You can imagine being familiar with the West-European Culture and tradition this really astonished me. I was convinced either I follow the Marapu priest or the Christian priest. Either I follow the one believe or the other believe. I could not imagine to follow both at the same time, for the same purpose. In Indonesia, and I now think about the different cultures on the various islands which I visited, I found a similar behavior pattern, asking allowance from the representative of the traditional culture to join the new culture. Following the “guidelines” of my tradition here in Europe, I would believe the old couple to be in a big cultural gap. A gap which also would force strong decision problems. Problems of orientation and (self-) allowance. I would think, that I would lose my orientation as I could not imagine to follow both priests, both believes or both traditions at the same time like the Sumbanese couple did.